Three layers work together in these Homemade Twix Bars. 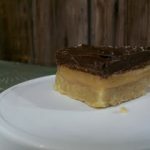 A shortbread base, chewy caramel and a thin layer of chocolate, the results are a twix bar. 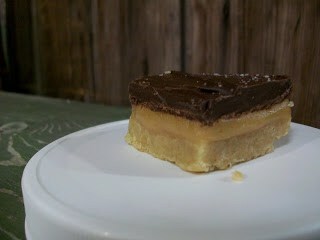 Obviously, NOT a perfect factory made Twix but a Twix bar recipe nonetheless. Last week for the watercolor class I offered to bring a “Twix” copycat bar. When asked “what is a Twix copycat bar, I think I answered “a chocolate caramel ultimate evilness that I am afraid to make and be alone with in my house” Yes a 9×13 pan of chocolate and caramel scare me, bears in the woods, yeah not so much. I made these on a craft day in and around felting eggs. They are easy, fast, really good, and they look pretty. I only managed to bring one home for my husband…and there were only 9 of us in the class…see? I knew I needed someone to be watching how many I ate except they were all busy stuffing their faces too painting. A blogger friend made these, well they looked so good I had to make them. Thanks Coleen, they were a hit. then reduce heat and simmer for 7 minutes, keep stirring don't stop! I think next time I make these (the Share Our Strength Food Bloggers Bake Sale) I will cook the caramel a bit longer, I felt it was too soft. Although they held up well in the warm painting class room I think a bit harder would make them perfect. About the Share Our Strength Food Bloggers Bake Sale. It will be the 17th of April, I hope to have my location nailed down in the next 2 days. I am looking for a few crafty souls, maybe you own an etsy shop, or just like to sew, I would love to gather a few pretty aprons to sell at the bake sale booth. Any ideas? Want to donate? I am open to all ideas! I will also(hopefully) be adding a donate button to the sidebar soon so friends can donate from afar. and this is what my husband got after I took the picture-HA! Oh, wow…yum. That is all I can say. I haven't had a twix in such a long time. Crunch caramel goodness! I need to try making these at home. Yum!!! OMG, these look good! The kicker for me is the sea salt on the top. Oh how I love salted caramel … that mixed with the chocolate = Diva Heaven! I don't think I could be left alone with these bars either. he should consider himself lucky that he got that piece. ha! I would have eaten the entire thing. Monica that's what I told him, he wasn't convinced! What ever, right? Carol-hence me making them when I knew I would be watched!! Twix is one of my favorites and this looks soooo good. I'm not sure I could be trusted around it though. I always end up eating the most, and that is a very bad thing. 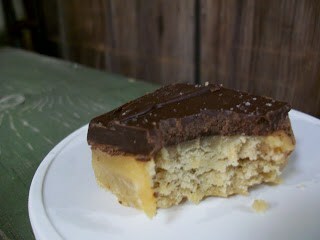 Mmmmmmm…homemade Twix….can't wait to make this one! I may need to wait until the hubby is out of town so I can eat it all! Ohhhh Michelle don't be a hater-just make sure you SHARE them!! Suzy don't be alone with these things whoa! Diana you may want to not eat the whole thing, I'll be jealous!! I was reading through yours and once I saw the word "Twix," I knew chocolate had to follow. You've caught my undivided attention!